You’ll all be happy to know that I’ve made it safely to Texas. This past weekend I temporarily bid New York City farewell and boarded a plane to Houston, TX where I spent but a short two days. Then it was on to Austin, TX, where I am now enjoying my director’s lovely home. Rehearsals for Sycorax have begun and I’m here now to give you all the juicy details that you’ve all been clamoring for. So, without further ado, I bring you the official press release for Sycorax! 8 Performances June 17-20 & 24-27 at up and coming Austin theater the Gemini Playhouse at 5214 Burleson Road, Austin, TX. Tickets to be sold on a sliding scale, pay what you will. Refreshments will also be available. Don’t miss this great opportunity to see this amazing new work at Austin’s newest theater venue! The Weird Sisters are proud to be performing an original work by one of our founding members, Susan Gayle Todd. Though the play is a departure from our rollicking comedies of the last few years, we are still working with our collaborative method, sharing ideas, techniques, and jobs. We are looking forward to sharing this powerful work with a new audience. Sexuality. Power. Oppression. Magic. It’s a take on Shakespeare’s The Tempest that you’ve never seen – feminist theater at its most incendiary. 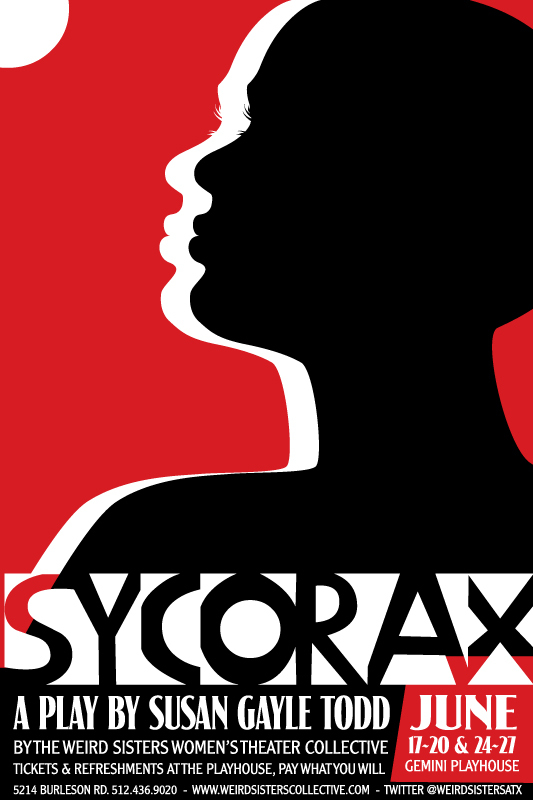 An original work written and collaboratively directed by co-founder, Susan Todd, The Weird Sisters Women’s Theater Collective performs Sycorax beginning in June at the Gemini Playhouse in South Austin. Azure D. Osborne-Lee as Sycorax, a healer of Algiers who rises to prominence through her arts – and through her relationship with the enigmatic spirit, Ariel. When a catastrophic storm destroys Algiers, Sycorax is blamed. Stripped of her power and her lover, she is cast out and later marooned to become the “witch” of the isle from The Tempest.